Passenger airplane flying high in a cloudless blue sky. A tattered American flag flaps in the wind in front of apartment buildings in New York's Little Italy neighborhood. 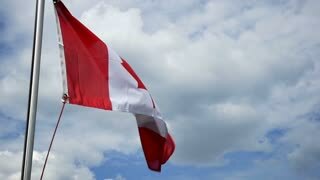 A Canadian flag flaps in the wind. Shot at 96fps. Epic slow motion shot of commercial jet coming into land. Pearson International Airport, Toronto, Canada. No logos visible. The Texas flag waving in the wind. The Lone Star flag flaps in the breeze, filling the whole frame. An Emirates Airbus A380 on final approach to Toronto Pearson International Airport after a long-haul flight from Dubai. A bronze head looks toward Copley Square in front of the Boston Public Library in Boston, MA USA while an American flag flaps slowly with a lens flare. Airplane window, looking outside, POV. Aircraft landing or taking off. Night, illuminated city. Its possible to see land / city through the window. Aerial view, wide shot, wing. Bad tarp job. A blue, ripped tarpaulin flaps in the wind. Landing at Pearson Airport in Toronto, Ontario, Canada. Large jet airplane is flying over runway approach lights at the airport of Schiphol at dusk. A Gentoo penguin moves foreword and flaps its wings. A captive hawk flaps its wings at a wildlife display in Dublin. Cockpit of an Airplane. Stop at the Runway.